School of Fish: What a couple of weeks! It is hard to believe everything that has happened in the past couple of weeks. I can't share everything, but it is amazing to see what God has accomplished and brought us through in these past few weeks. If I were to go into detail this post would be way too long so I will just hit the highlights. A team of friends from our home church in Georgia came to visit us. This team was comprised of 4 adults and 3 children. 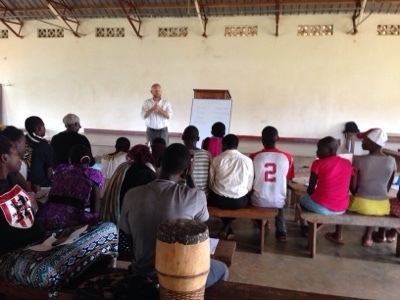 They brought many very useful supplies and experienced life with us here in Buwundo, Uganda. 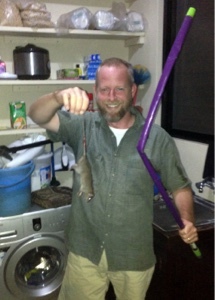 One experience was helping David to catch and kill the rat that was driving me crazy! In addition to rat catching and general encouragement, they came to do computer training, medical training and an optometry clinic. They saw nearly 400 patients, providing over 100 pairs of glasses for those who needed them. Several people commented that they could now read the Bible since their vision has improved! We are so grateful for this amazing blessing and service they were able to provide. Here is a photo of students waiting for their vision screening to determine if they need to be seen by the optometrist. After assisting with 3 days of clinics, we taught children's church, took our friends to the source of the Nile, and to see reptiles. Then one of my children started having fevers and was achy which turned out to be strep throat. He was up in the night feeling very ill. He was diagnosed the day before we needed to take our team to the airport and say goodbye. That night our neighbor boy who is 8 years old and has a seizure disorder wandered off and did not return. His family called me at 11pm after they had already been searching for hours. I prayed with them and supplied some back up lanterns and flashlights since their batteries were running low. It rained extremely hard that night and all I could do was pray most of the night. The next morning one of his aunts found him in a field. He was extremely cold! 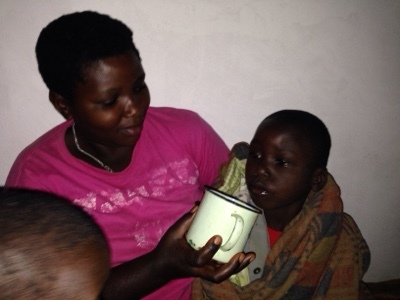 Here is a photo of another aunt warming him with tea. Praise God he seems to have returned to his normal! After our friend was found, we needed to leave to take our team to the airport. Since I was checking on my friends, I needed to quickly pack up and prepare to go. We planned to take them to the zoo and out to eat before dropping them off at the airport. 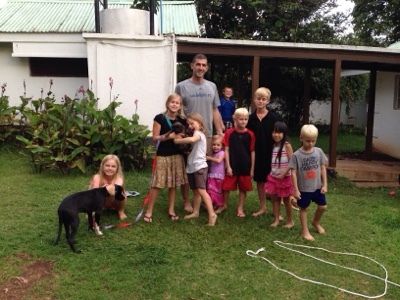 We had a great time and they got to see several Ugandan animals up close and personal. Since their flight was leaving very late at night, we had planned to spend the night at the zoo and then return home to GSF the next day. We made all of those plans before realizing that it would be the day before the presidential inauguration and there would be difficulty driving back. In Entebbe we were diverted to a side road. Since it was raining heavily and the side roads were dirt roads, we moved slowly. We finally reached a point where we were supposed to rejoin a paved road, but there was a big truck stuck in the mud ahead of us. Instead we ended up traveling on back roads all the way around to the west of Kampala in order to take a bypass to the north in order to eventually head east to go home. A normally 4-5 hour trip took about twice that time. At least we did not pass through the part of Kampala where there was tear gas that day. During the bus ride, 2 of our other children began feeling sick. By the time we reached home, I realized that one or both of them also had strep. Cue another 2 nights of kids not sleeping, fevers, etc. David had to drive to Jinja the next day in order to get antibiotics for my other kids. In the meantime we were on a social media block by the Ugandan government. The social media block and road blocks were attempts to prevent riots or terrorist activities during the inauguration. While all of this made for a few crazy weeks, the icing on the cake was when I walked out my back door and found my dog playing with something that looked a bit unusual. At first I thought that she had a dead rodent or something. It obviously had fur and she was tossing it into the air. I called David and we walked closer to see what she had. It was goat testicles. Yes, my dog was chewing on and playing with goat testicles. You can't make this stuff up. Our neighbor had slaughtered a goat and our brought us some meat. Then our dog had found the testicles to use as a chew toy. At the end of these crazy couple of weeks David and I were scheduled to speak at a conference for high school and college students who grew up at GSF. They are in between the first and second terms of school and it is a way for them to connect with each other and those of us here at GSF. We were glad to be a part of the conference, but we also had a full day scheduled. 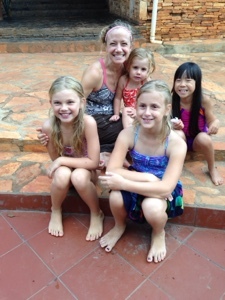 We needed to go to Jinja to run a few errands and to celebrate Esther's birthday with some friends in town. One of Esther's closest friends here in Uganda has a birthday one week before Esther's, so we met at a pool to celebrate together. Actually in the last month 4 of the girls in this family celebrated birthdays. Here is a photo of the birthday girls. Since the mom is also a friend of mine and she celebrated her birthday while our team was here, her husband offered to keep all 10 of the kids from our 2 families while David ran errands and I took my friend out for a birthday dinner. He may win a dad of the year award for this. It was a great end to a very busy couple of weeks! We are praying that today will truly be a day of rest! We only have church and an evening Bible study with neighbors on our schedule. Praying that is similar to what God has planned for us today! Loved reading this post! love all of my precious ones!